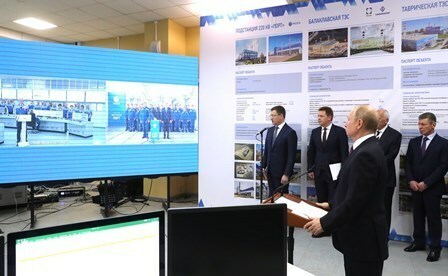 Vladimir Putin took part in the ceremony launching the Balaklavskaya thermal power plant and launched the Tavricheskaya TPP and the Port substation in Taman via videoconference, says press center of Kremlin. The inauguration ceremony of the new power units was attended by Deputy Prime Minister Dmitry Kozak, Energy Minister Alexander Novak, Head of the Republic of Crimea Sergei Aksyonov and Rostec CEO Sergei Chemezov. “Today we have taken one more step towards strengthening the energy security of the Crimean Peninsula and southern Russia as a whole, and towards the further development of the region’s economy and infrastructure. A new modern substation, Port, will come into operation in the Krasnodar Territory. We need it for developing the Taman seaport and to ensure the operation of the Crimean Bridge”, said the President. Vladimir Putin said that energy consumption in Crimea today is between 1,000 and 1,100 MW. With the launch of these new capacities, the energy capacity of Crimea and Sevastopol will reach some 2,070 MW.